Sometimes a book finds you. 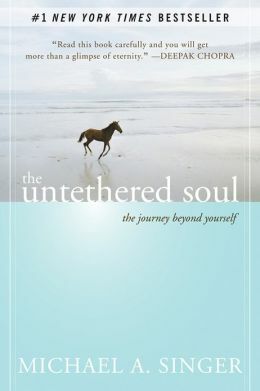 When The New York Times “By the Book” recently interviewed Robin Roberts, she mentioned Michael Singer’s The Untethered Soul as the book that “taught me how to gently calm my thoughts and emotions.” Seems like a skill everyone could use, so I looked for the book. Although I’ve just started this slim volume, the tone is similar to others I’ve read – Thich Nhat Hanh’s The Miracle of Mindedness and Jon Kabat-Zinn’s Wherever You, Go There You Are, or any by Deepak Chpra – books on meditation with suggestions for well-being and self-realization. Unfortunately, I forget their message and return to my own cynical view of the world soon after reading. Perhaps reading another could motivate my inner self to shape up – again. Although Singer’s book made the best seller list and was touted by Oprah, I missed its debut (or ignored it). The chapter titles offer a mix of possibilities – a few appealing; others I many skip, but the opener – “The Voice Inside Your Head” – has me already talking to myself – but then I always did. This entry was posted in authors, book review, books, nonfiction, reading and tagged Book, Deepak Chopra, Jon Kabat-Zinn, meditation, New York Times, reading, Robin Roberts, self-realization, The New York Times Best Seller list, The Oprah Winfrey Show, the untethered soul, Thich Nhat Hanh. Bookmark the permalink. I know what you mean. I read books like this and while I’m reading them I’m convinced that this is the way forward for me and I’m totally on board with the message. Then I move on to the next book and go back to my usual world view. I do like to keep coming back to this type of book though so maybe one day the message will stick! book velcro? I’ve already moved on to another book, thinking I can always go back when needed.